It's Halloween. I've drawn/painted Whitby Abbey many times but I've never seen Dracula nor been bitten by a vampire - but there again I do eat a lot of garlic! 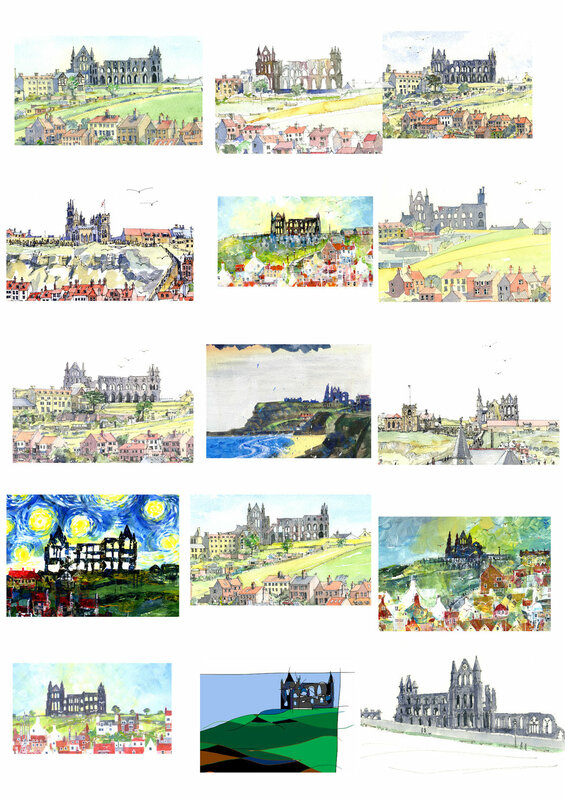 This year I thought I should join in the occasion and post a collection of my Whitby Abbey artwork. Another from our holiday in Puerto Soller, Mallorca last May/June. Starting with an urban sketch in pencil from the interior of the Hotel Es Port. I sat in the bar looking at the olive presses which have now been beautifully restored and are part of the sitting area. I developed that pencil sketch (on the left) to a finished painting of the interior - it tested my skill! 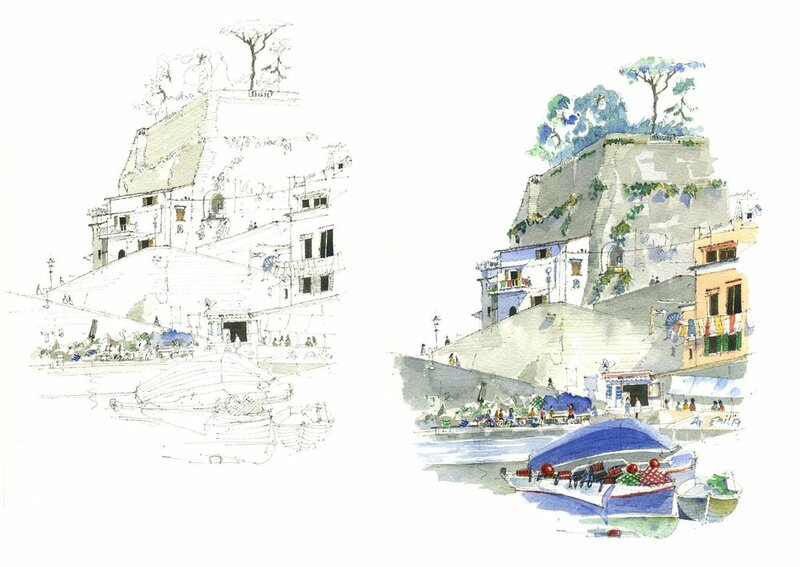 This is an urban sketch of Es Port in Puerto Soller, Mallorca from our visit there last May. It's now an Hotel but it's been the centre of the Montis Family Estate for centuries. When I was sitting in front of the building sketching, 3 young people gathered round, followed by their grandfather. He turned out to be a consultant solicitor from London and he asked if I didn't mind that he sat down and had a chat. 90 minutes later we had to break up! He was such an interesting person, we talked about lots of things including "copyright"! I had to go back the next day to finish painting! We were on holiday so it was all part of our enjoyment. 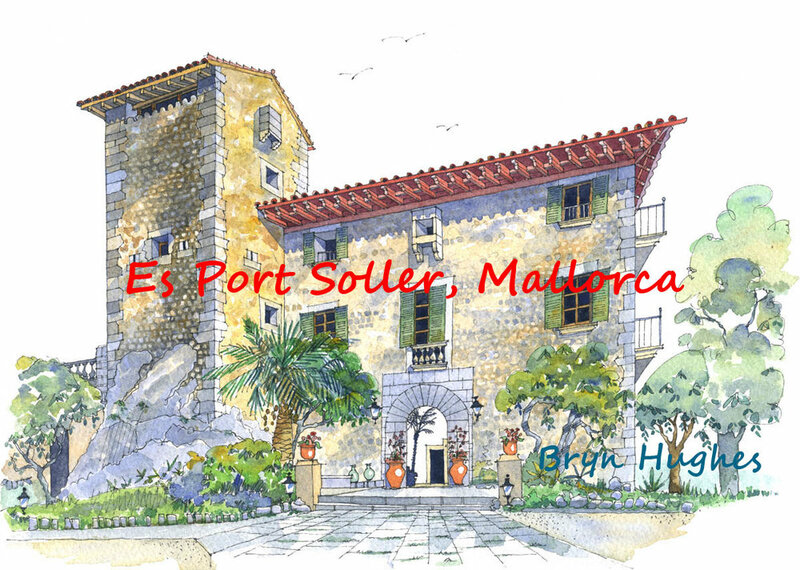 Michel, the President of the "Soller French Society" has now got a digital copy of this image to use in his talks and information promoting the links between France and Mallorca - Soller and the traditional export of oranges in particular - so we're all happy! Michel introduced us to the latest Head of the Montis family and showed us around the old, refurbished parts of the House/Hotel - in particular the old olive pressing facilities and storage which I shall post images of (soon). 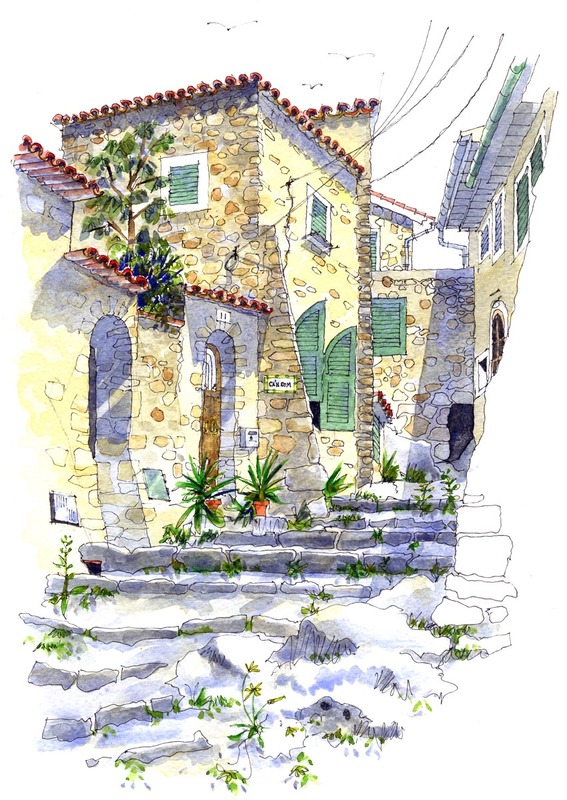 This urban sketch is from our visit to Mallorca last May/June. It's called Ca'n Rom which is in Fornalutx - the most beautiful village in Mallorca. It's at the top of the steps above the Placa d'Espanya with the most stunning views over the Soller Valley. Google "Ca'n Rom, Fornalutx" if you would like to see the amazing interiors. Just had to draw and paint the house from this dramatic angle! More from Mallorca (soon). The final morning and final sketch on our tour. My favourite part of Sorrento, I could spend a lot of time in this little harbour - it's called Marina Grande. Vesuvius is about 15 miles away behind that cliff. Been on our travels again - escorted tour with Riviera Travel to Sorrento and the Amalfi Coast. My first Urban Sketch was of the Belltower of the Cattedrale di Sorrento from the narrow Via Reginaldo Giuliani. El Tren from Palma arriving at Soller, Mallorca. Did this one when staying at Puerto Soller last May. Been visiting the Port most years since the end of last century and is the latest of dozens of my sketches of the area. The fishing boat "Arkane" at Whitby harbour at the mouth of the River Esk last weekend - pretty little boaty! Another 96 of my Sheffield Skylines 01 & 02 cards ready for delivery to the Millennium Gallery Shop in Sheffield right next to the TV area for the World Snooker Championship at the Crucible. Just 48 prints to mount and pack in the next few days. Holy Trinity Church, Sloane Street sketched while sitting on a bench waiting for my dearest (not literally!) wife Liz browsing in the local John Lewis. The rains came just as I was finishing off the penwork so the watercolour was added in our cosy little home later. The original is hopefully by now in the U.S. on it's way to my top collector in Texas. Feb 23-2017 Storm Doris hits UK, winds blow plywood roofs onto rails, 2hr train journey from Sheffield to London turns into 6hrs, 5hrs standing. Inspiration for sketch of Admiral Nelson's hat blowing off at Trafalgar Square sketched from the steps of St Martins ITFs! The original sketch is now flying to a client in Texas. - my list of paintings for the "Ten Artists Exhibition"
Here is the list of my paintings for the "Ten Artists Exhibition" at Baslow Village Hall tomorrow and Sunday. The weather forecast is good for tomorrow and not bad on Sunday - come and see us, the other 9 Artists are much better than me. 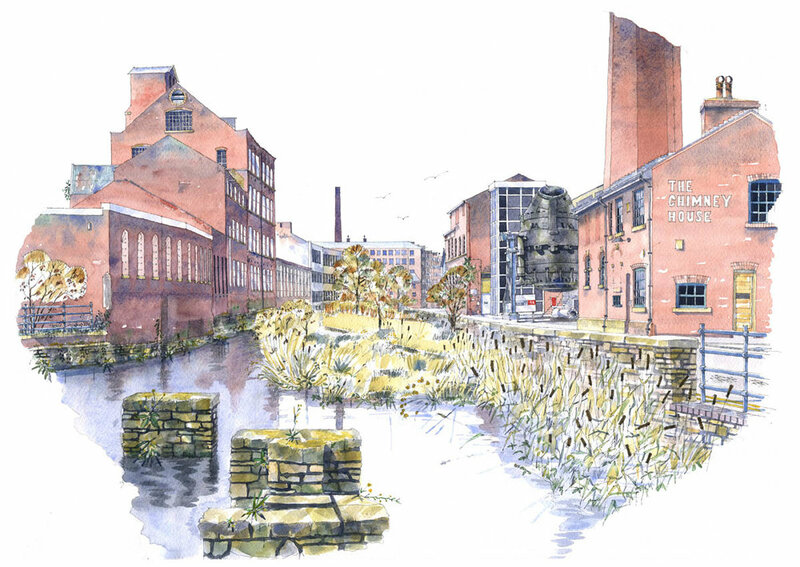 I've always had in my mind to do a proper full width Panorama of the right bank of the River Esk at Whitby Harbour in pen & watercolour. Here it is (another adulterated version) - 600mm wide and the pristine version will be at the "10 Artists & 10 Paintings Exhibition" at Baslow on Saturday & Sunday 22nd & 23rd October. Fornalutx, Mallorca, where the best Police and most honest Taxi Drivers on the Island helped recover my mislaid wallet in September 2014 - forever grateful. A postcard of Fornalutx tumbling down the hillside from a work colleague was the reason we first visited the Soller Valley in 1999 and almost every year since - quite often twice in the same year.